That's me upper left, looking through my goggles at Pete Sampras in high speed video at the US Open in 1997. In 1997, we did our first high speed filming of professional tennis. And we have continued to film the top players ever since. It's now been 20 years. So what have we learned? How has the game evolved technically? And what are the implications for not just elite players, but for the rest of the tennis playing world? This new series presents a summary of that work, starting this month and next with the forehand. 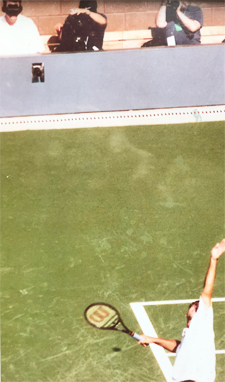 In 1997, when I sat on the sideline with a high speed camera in the first year of Arthur Ashe Stadium, Andre Agassi and Pete Sampras were still at the top of the pro game. Tennis had seen two huge changes—the transition to graphite rackets and to predominant hard court play with two Grand Slams, Australia and the US, going from grass to hard courts. The continental grip was a thing of the past. The power baseline game was becoming much more widespread, but players including Sampras, Pat Rafter, Tim Henman, and Greg Rusedski were still winning playing serve and volley. Most players still had conservative grips by today's standards—not continental certainly, but eastern or modified eastern or mild semi-westerns. Off the ground, hard relatively flat winners were predominant at least on hard courts. That same filming was the first work ever to measure actual spin rates. Sampras and Agassi were generating a little less than 2000rpm of spin on their forehands. (Click Here.) Sergi Bruguera was generating spin levels over 3000rpm, but that was seen as something that worked only on clay. Rafael Nadal was 11 years old.